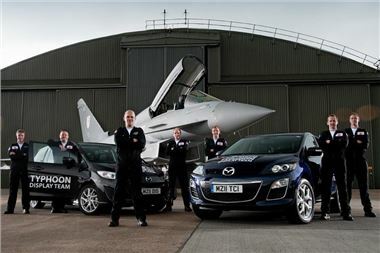 Mazda Motors UK has provided three vehicles to the Royal Air Force Typhoon Display Team in support of the Team’s 2011 activities. The three vehicles, one Mazda5 and two Mazda CX-7 models, are being utilised by the Team for transporting kit, personnel and computer support equipment for the Typhoon aircraft. “The Typhoon Display Team carries out an important role in promoting the excellence of the Royal Air Force’s equipment, personnel and ethos. The association with Mazda ensures that the Display Team can conduct these tasks to the highest professional standards due to the support provided by the three vehicles,” commented Wing Commander Al Seymour, Officer Commanding 29(Reserve) Squadron. The Typhoon Display Team will conduct a large amount of travel throughout the year when the Mazda vehicles will fulfil a variety of roles. These include pre-season travel, such as trips to use the specialised BAE Systems simulator and team meetings. The Team will conduct and host approximately 50 visits at RAF Coningsby and externally at schools and colleges during the year. In 2010, the Team raised over £12,000 for its chosen charities. In 2011, the Team will be fundraising for the Not Forgotten Association, Make-A-Wish® Foundation and the Forces Children Trust at various events. “The busy 2011 season will involve travel to display venues across the UK, Northern Ireland and Europe, therefore having the three Mazda vehicles for team use is invaluable. The comfortable and spacious Mazda CX-7 and the Mazda5 with its flexible seating and sliding rear doors are ideal for transporting our team personnel, their kit and computer support equipment for the Typhoon aircraft,” commented Sergeant Liam Whelan, Typhoon Display Engineering Manager. The Royal Air Force Typhoon is a world-class multi-role jet. With the Typhoon, the RAF has a combat aircraft capable of being deployed in the full spectrum of air operations for the first time in its history. From air policing and peace support all the way through to high intensity conflict, the Typhoon can do it all. This exceptionally flexible and capable aircraft has, without a doubt, significantly increased the RAF’s war fighting capability.